Russell Edward Gregg “Coach”, 91, of Whitehall, OH passed away on Monday, March 18, 2019. Russ was born on January 6, 1928 in Ashville, OH to the late Herbert L. Gregg Sr. and Lula (Pettibone) Gregg. Russ Gregg was a 1945 Graduate of Ashville Harrison High School where he helped lead the Broncos to the State Basketball Tournament. They were the first team in Pickaway County to advance to the state tournament, where he was selected to the All-State team. Russ was the first player in Pickaway County to score 40 points in a basketball game. He attended Ohio University on a basketball scholarship before signing a professional baseball contract with the Brooklyn Dodgers. He later graduated from The Ohio State University. Russell was preceded in death by brothers Dr. Walter H. Gregg (Betty) and Herbert L. Gregg Jr. (Donna Jean). Survived by loving wife of 68 years, Clara (Roese) Gregg; children Rex (Cynthia) Gregg, Van (Cathy) Gregg and Mitzi Gregg Buck (Wayne); grandchildren Russell (Paige) Gregg, Eric (Heather) Gregg, Diana Gregg Glanzman (Joe), Julie Buck Peters (Jason), Shane (Kristin) Gregg and Shannon Jo Crawford (Nick); great grandchildren: Jonah, Nate and Caleb Gregg; Cate, Joey and Mikey Glanzman; Duncan, Clara and Daxton Peters; Ross Gregg; Olivia Gregg; Cooper, Tate and Emersen Jo Crawford. Russ was an educator, coach and Driver Instruction teacher for 32 years. During his teaching career, he taught in the Ashville, Teays Valley and Whitehall Yearling school districts. He is a member of the Ohio High School Basketball Coaches Hall of Fame, The Ohio Capital Conference Hall of Fame, The Central District Basketball Hall of Fame and Teays Valley High School Hall of Fame. He was awarded The Whitehall Education Foundation Award of Excellence, Rogers Neighborhood Basketball Legend of the Game and was Founder and first President of the District 10 Basketball Coaches Association. He was a six-time OCC Coach of the Year, Central District Coach of the Year and Ohio Coach of the Year. He coached Whitehall Boy’s 1982-83 basketball team to the AP-UPI State Poll Championship and was a Paul Walker Award Winner. 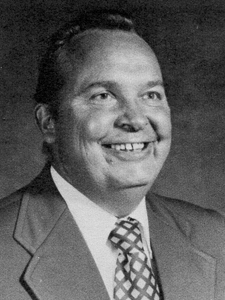 He founded Russ Gregg Ohio Prephoop, the first basketball scouting service for girls’ basketball. Whitehall dedicated its gymnasium in 2006, naming it the Russ Gregg Gymnasium. Russ was a member of the Whitehall United Methodist Church, where he served on various councils and committees. The family would like to thank the Bickford of Bexley and Kindred Hospice for their excellent care. Visitation with the family will be held from 1:00-3:00 p.m. on Fri. March 22nd at Village Chapel Church, 30 Circleville Ave. Ashville, OH 43103 and a Memorial Service following at 3:00 p.m. with Rev. Kathleen Herington officiating. On Sat. March 23rd at 2:00 p.m. A Celebration of Life will be held at Russ Gregg Gymnasium at Whitehall High School, 675 So. Yearling Rd. Whitehall, OH 43213.